Door Step School, an NGO working for education of underprivileged children in Pune, has taken up this challenge along with 3DPLM Software Solutions Ltd., an IT company located in Hinjawadi-Pune, to create awareness about importance of sanitation and cleanliness among school-going children under the project 'Teach Them Young'. Personal hygiene and sanitation habits are being taught to children in primary schools across Pune city. One of the objectives of this project is to ensure basic infrastructural facilities in the schools. These include sufficient water supply, separate and clean toilets for boys and girls, monitored mid-day meal activity in government and private schools, etc. 3DPLM Software Solutions Limited is 2nd largest R&D lab of 3DS & an integral part of DS ecosystem. 3DPLM’s CSR – ‘the 3D-way of giving back’ is committed to create a positive, sustainable transformation in the community through passionate and dedicated efforts of the organization and its employees. 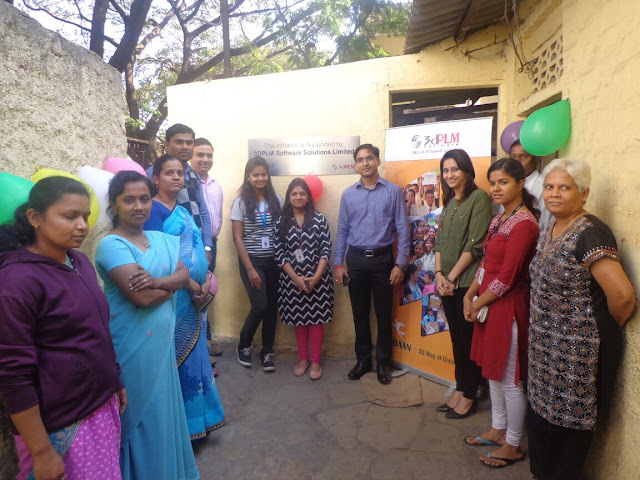 As an organization, 3DPLM has always been a socially aware entity, and has been consciously contributing towards the welfare of the underprivileged sections of the society through various events & initiatives. The company has come forward to help Gopal Krishna Primary School, a Government-aided private school in Gokhalenagar area of Pune. This school provides education to children from economically weaker section, at nominal tuition fees. Around 175 children are enrolled in this school studying from first to fourth standards. The basic sanitation facilities such as toilets, water storage tank, wash basin, etc. have been provided at the school, under Corporate Social Responsibility (CSR) initiative of 3DPLM Software Solutions Ltd. An inauguration event of these facilities was held in the school on 10th January, 2017. Mr. Rajiv Naithani, Director HR from 3DPLM Software Solutions Ltd. was the Chief Guest during the programme. There were many volunteers from this company who joined this program, along with Door Step School representatives, and teachers from Gopal Krishna Primary School. 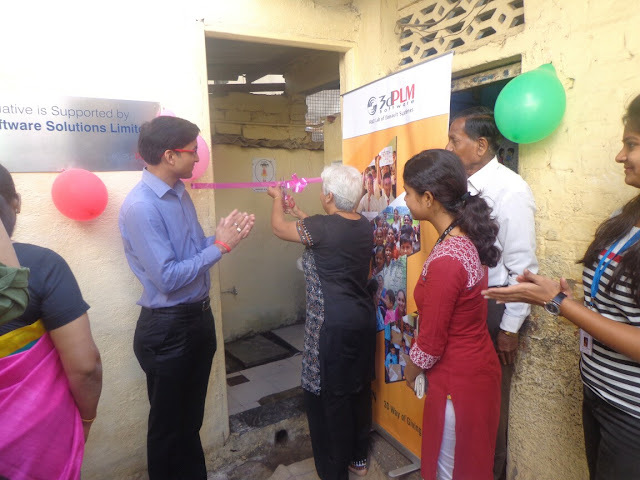 Apart from this private school, 3DPLM has also supported construction and renovation of sanitation facilities like separate toilets/Washrooms for girls and boys studying at a Zilla Parishad Primary School in Kondhwe-Dhawade village. A separate storage tank has been provided to store drinking water. Also, water filters have been installed in the school under CSR initiative of the company. Around 350 students from first to seventh standard will be benefitted by the improved facilities in this school. With a vision of giving back to the society and helping inclusive growth of deprived community, 3DPLM has been supporting education and child welfare activities in Pune. With such positive support, Door Step School is planning to extend the sanitation project to more Government and private schools in the city. पुण्यातील वंचित मुलांच्या शिक्षणासाठी काम करणा-या ‘डोअर स्टेप स्कूल’ या स्वयंसेवी संस्थेने हिंजवडी येथील ‘थ्रीडीपीएलएम सॉफ्टवेअर सोल्युशन्स लि.’ या माहिती तंत्रज्ञान क्षेत्रातील कंपनीच्या मदतीने शालेय विद्यार्थ्यांना योग्य वयातच स्वच्छतेच्या सवयी लावण्यासाठी व शाळांमधून स्वच्छतेच्या सुविधा उपलब्ध करुन देण्यासाठी ‘लहानपणीच गिरवू धडे’ हा उपक्रम सुरु केला आहे. पुणे शहरातील काही सरकारी व खाजगी प्राथमिक शाळांमधील मुलांना स्वच्छतेचे धडे दिले जात आहेत. याअंतर्गत शाळांमधे स्वच्छतेच्या सुविधा, उदाहरणार्थ पुरेसा पाणीपुरवठा, मुला-मुलींसाठी स्वतंत्र व वापरण्यायोग्य स्वच्छतागृहे यांची उपलब्धता करुन घेतली जात आहे, तसेच नियंत्रित मध्यान्ह भोजन उपक्रमही राबविण्यात येत आहे. थ्रीडीपीएलएम सॉफ्टवेअर सोल्युशन्स लिमिटेड ही थ्रीडीएसची दुसरी सर्वात मोठी आर ॲन्ड डी लॅब असून, ती डीएस इकोसिस्टीमचा एक भाग आहे. कंपनीच्या व कर्मचा-यांच्या समर्पित प्रयत्नांमधून समाजात एक सकारात्मक व शाश्वत बदल घडवण्याच्या उद्देशाने थ्रीडीपीएलएमचा ‘सीएसआर’ उपक्रम – ‘दी थ्रीडी वे ऑफ गिव्हींग बॅक’ – राबविला जात आहे. सामाजिक प्रश्नांबाबत थ्रीडीपीएलएम ही कंपनी नेहमीच संवेदनशील राहिली असून, विविध उपक्रमांद्वारे समाजातील वंचित घटकांच्या कल्याणासाठी योगदान देत आली आहे. पुण्याच्या गोखलेनगर भागातील गोपाळ कृष्ण प्राथमिक शाळा या शासन-अनुदानित खाजगी शाळेच्या मदतीसाठी कंपनीने पुढाकार घेतला आहे. ही शाळा परिसरातील आर्थिक दुर्बळ कुटुंबांमधील मुलांना नाममात्र शुल्क आकारुन शिक्षण उपलब्ध करुन देत आहे. सदर शाळेत पहिली ते चौथीच्या वर्गांमधे साधारण १७५ मुले शिकतात. या शाळेमधे मुला-मुलींसाठी स्वच्छतागृहे, पाण्याची टाकी, वॉश बेसिन आदी स्वच्छतेच्या सुविधा थ्रीडीपीएलएम सॉफ्टवेअर सोल्युशन्स लि. यांच्या कॉर्पोरेट सोशल रिस्पॉन्सिबिलिटी (सीएसआर) उपक्रमांतर्गत पुरविण्यात आल्या आहेत. दि. १० जानेवारी २०१७ रोजी या सुविधांचे उद्घाटन थ्रीडीपीएलएम सॉफ्टवेअरचे संचालक (एचआर) श्री. राजीव नैथानी यांच्या हस्ते करण्यात आले. कंपनीचे इतर अधिकारी व स्वयंसेवक, तसेच ‘डोअर स्टेप स्कूल’ संस्थेचे कार्यकर्ते, शाळेचे पदाधिकारी व शिक्षक यावेळी उपस्थित होते. या खाजगी अनुदानित शाळेसोबतच, थ्रीडीपीएलएम कंपनीने कोंढवे-धावडे गावातील एका जिल्हा परिषद प्राथमिक शाळेतील स्वच्छतेच्या सुविधांसाठीही निधी उपलब्ध करुन दिला आहे. ‘सीएसआर’अंतर्गत या शाळेत, मुला-मुलींसाठी स्वतंत्र स्वच्छतागृहांची दुरुस्ती, पिण्याच्या पाण्यासाठी स्वतंत्र टाकी, तसेच जलशुद्धीकरण यंत्र (वॉटर फिल्टर) चे काम हाती घेण्यात आले आहे. सदर शाळेत पहिली ते सातवीच्या वर्गांमधे शिकणा-या सुमारे ३५० विद्यार्थ्यांना या सुधारित सुविधांचा लाभ घेता येणार आहे. समाजाचे देणे फेडण्याच्या व वंचित घटकांच्या सर्वांगीण प्रगतीसाठी मदत करण्याच्या हेतुने थ्रीडीपीएलएम कंपनीतर्फे पुण्यातील शिक्षण व बालकल्याण उपक्रमांना सहाय्य पुरविले जात आहे. अशा सकारात्मक पाठींब्याच्या आधारावर, डोअर स्टेप स्कूल संस्थेने सदर स्वच्छताविषयक उपक्रम शहरातील इतरही सरकारी व खाजगी शाळांमधून राबविण्याचा संकल्प केला आहे.